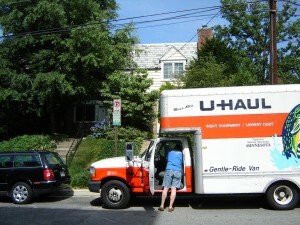 When it comes to moving, deciding what to take with you — and what to leave behind — can be stressful. Spending a little time clearing out dead weight before the move will make settling into your new place much more freeing. Check these 10 areas of your home for items that aren’t worth the square footage in the moving van — or your new home. This may seem obvious, but food takes up a lot of space and often gets a bit lost in the moving shuffle. In the weeks before your move, eat anything that isn’t shelf-stable, brand-new or a specialty item. Don’t forget about the perishable foods in the fridge and freezer (steak for dinner, anyone?). Take a break and throw a pantry dinner party with friends who are helping you move. Low-quality furniture, typically made of particle board, is very susceptible to being ripped and chipped in a move. Ask family and friends if they can use any of these pieces or bring them to your local donation center. Upgrade or replace when you get to your new home. Anything old, stained or that no longer fits should go straight into the donation bin. Moving cross-country? Transitioning from a cold climate to Florida will allow you to shed even more weight as you let go of snowsuits and boots that won’t be of use in the Everglades. Donate to a local thrift store or have a garage sale to make extra cash. There is no sense moving 20 crusty nail polishes and every curling mousse you’ve ever tried and abandoned. Anything expired or unused lately should be tossed. Cull these and only keep your essentials, as anything else may spill in transit and many are flammable.